A long time ago, when businesses were first starting to build web pages, they were used a lot like billboards. A few static pages with basic information was enough, or so they thought. Now it has gone completely in the other direction. New content needs to be consistently produced to stay on top of the rankings. But why do you need that stream of content? Isn’t just having a few strong static pages enough? It can work, but it’s really rare and really only for sites that have been around for years, if not decades. Let’s look at why creating a stream of content is good for SEO. Google uses hundreds of signals to determine where to rank a page in their index. The ones that are most familiar are a good backlink profile and quality content. But another signal that Google looks for is how often a site is updated. Websites are considered to be living documents. A site that gets information added or updated on a regular basis triggers another analysis of the site with the changes, but it also tells Google and other engines that someone is out there paying attention to the site. If a site isn’t getting a lot of views and Google isn’t detecting that someone is adding things to it, it rightly assumes that it is an abandoned site and will push it down the rankings. An old abandoned site can still be found by searching for it directly, but it’s not likely to pop to the top, or even the first page, in a related search. Another ranking signal that Google looks for is how many people are visiting your site over time. Sites that don’t get a lot of updates but still bring in a lot of visitors due to the usefulness of the content do get a pretty good ranking boost. Take the site websitesetup.org. It’s a simple site that explains how to make a website with WordPress. Beyond updating the copyright notice at the bottom, there’s not a lot that changes with this site. The process for making websites hasn’t altered all that much. But if you search “how to build a website” it pops right to the top because so many people use it to learn. That’s great for information-based sites, but for business websites it’s not so simple. Most businesses have to create a stream of content to keep people coming back. Businesses that can create interesting and relevant content pieces will bring a steady stream of traffic that keeps SEO high. Finally, the more pages that a site has the more chances it can be found through a search. 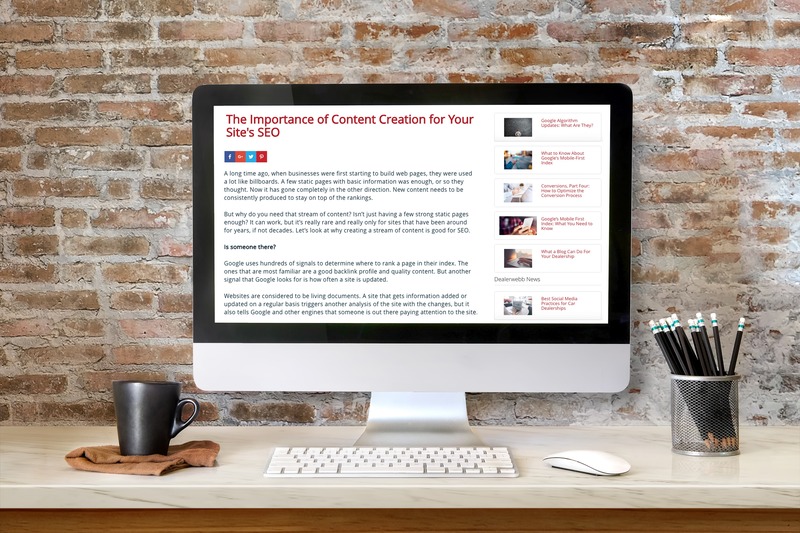 Writing content over a broad array of relevant topics on your site is a great way to increase the number of keywords that your site will get linked to. The more keywords you can connect to, the better your chances of discovery, so long as they are relevant to your business. Sites that create regular content more easily found, bring more visitors, and will be seen by Google as active sites. Thus, content creation sends search engines multiple signals that your site is worthy of higher ranking. If you’re not updating something on your site at least weekly, you can expect these signals to weaken. And if you stay away long enough, your site may drop down the ranks.